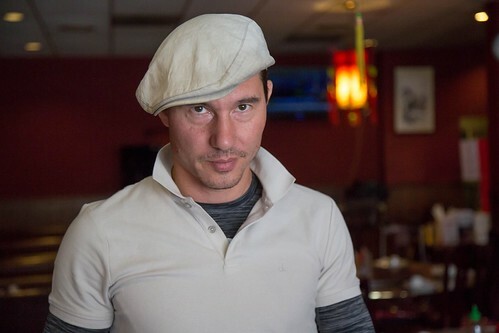 David William No is an actor, writer, producer, stunt performer and martial artist who has been involved in show business for two decades. 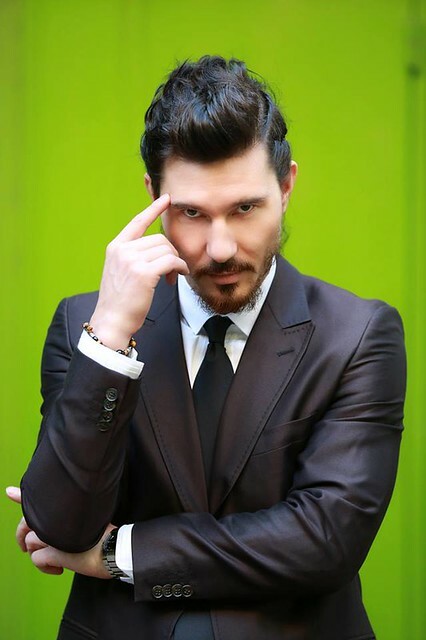 Starting out in his native Australia, No has worked on multiple movies and TV shows like The Matrix Reloaded, The Great Raid, Agents of S.H.I.E.L.D., NCIS: Los Angeles, Altered Carbon, and tons more (check out my his imdb page here). 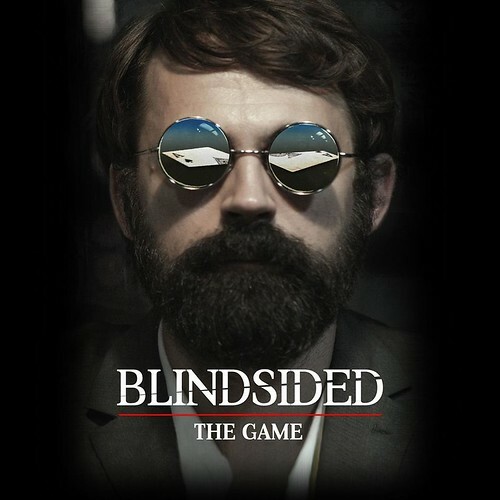 His latest project is Blindsided: The Game, the expanded short film starring Eric Jacobus and directed by Clayton J. Barber, where No plays the character Ace. He also served as a stunt performer, producer, worked on the editing and visual effects, and operated the camera on the movie. In this interview, No talks with this writer about Blindsided: The Game, his career, and more. David No: B:TG was a follow on project from the previous summer’s film, Blindsided. That little film was quite successful and people wanted a sequel. So Clay asked me to come back and produce again. As an Indy filmmaker myself, I have been fascinated in making longer films from shorter projects. Korea’s Ryu-Sueng Wan got his break from a feature he made called Die Bad, which was actually four short films. So I suggested we go this route for B:TG. BK: How did you approach your character Ace? DN: For B:TG, in addition to producing, Clay wanted me to play the role of “Ace.” As far as character went, Clay had a very clear idea of what he wanted, a character that didn’t waste time with words, but preferred to speak through his actions. Perhaps one that people would underestimate. I was a little hesitant at first, because I knew how much time and effort the producing part was. I was already expecting to be camera operating, and data wrangling, online editing, VFXing, color grading, and helping out with choreography, trying to feed the crews etc…, so I was concerned how much time I could put into the role. If it was just fighting, it wouldn’t have been so bad, but Ace is a card shark! So in my spare time I committed to learning and practicing cool card tricks and shuffles. I also watched and played a lot of poker. In the end, all this poker preparation paid off. The poker scene, just like a fight scene, needed to be choreographed. On the day of filming, Eric and I sat down and planned out each round of poker. Then we had a guy prepping the deck so that when I dealt the cards, the pre-choreographed hands would fall correctly. BK: How did you get involved in the movie stunt industry? DN: I was studying physiotherapy at university when I was approached by a film school student (Brent Houghton) who was making a Hong Kong action short for his final year movie. Both my parents taught martial arts, so I had been doing judo and taekwondo my entire life. That film, The Huntsman, went on to have this crazy cult success all around the world (at a time when there was no YouTube). From that project, I was choreographing action, doing stunts and acting. I thoroughly enjoyed the process and my eyes were now open! Brent and I started Furious Films and became the go to company for genre film-making and screenplays. I also started studying acting more seriously as well. I eventually got my Australian stunt qualifications (where you must hold certifications in body control, heights, water, vehicles, animals, fire, rigging etc.). BK: You’ve worked on a number of big movies as stunt performer, like The Matrix Reloaded and The Great Raid and smaller movies like Savage Dog and The Debt Collector. How were those “big movie” experiences different than the “small movie” experiences? How were they the same? DN: I have been fortunate to work in both the Indy and mainstream film industries, not just in one country, but all around the world. With Indy filmmaking, there is always no time and no money – so you have to prepare well but often you are forced to problem solve and improvise on the spot. Big Hollywood productions will often fix a problem with money, it will be more comfortable to work on and the meals will be better, but there are other constraints to deal with. In the end, whether it is a big budget film or a no budget one, what makes a good shot, good action, good color palette, nice lighting, better performances, it is all the same film craft, the same design language – no matter what the budget is. BK: How is working as a stunt performer in movies, big or small, different from working on a TV show like NCIS: Los Angeles or S.WA.T.? Are small movies and TV shows similar in the way they approach stunt work and action in terms of time or is that a misperception? DN: Traditional TV was more about “quantity” than “quality”, so often there is less time to prepare and less time to shoot. However, this is changing. There is a lot of exciting television that is being made almost like shooting a movie. In regard to stunt work, producers are realizing how much filmmaking knowledge the stunt team has and how it is used in action design as well as the importance of stunt rehearsal and training actors. It’s no good having an actor playing a badass character when they cannot move well. It’s the fastest way to lose an audience! No, if you want to stand out above the crowd, you need to put in the rehearsal time. 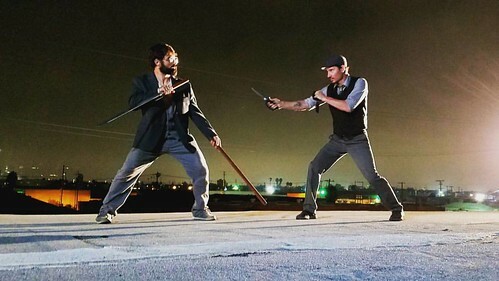 Even in B:TG, which was a cast of capable stunt-actors, we still met to design the action and rehearse the fights. BK: You worked as a stunt actor and as a “pre-viz” stunt performer on the Netflix show Altered Carbon. How are those two jobs different and how are they the same? DN: Larnell Stovall, the stunt coordinator, first brought me on to train the main cast. I spent 6 months with Joel Kinnaman before filming began. I followed him to NYC during the Suicide Squad world premiere and to Baltimore during filming for House of Cards. Later, I was involved in the first action concepts and pre-viz (pre-visualization). We would sometimes work on scenes at 87Eleven that would eventually be shot in Vancouver. But once the production was under way, the Vancouver team would sometimes send us choreographed scenes and I would have to prepare the actors in Los Angeles so they would be ready once they arrived in Vancouver. The “null-G” fight scene required a lot of wire-work and air awareness. Even though Larnell asked myself and Michelle Lee to play the roles, we still had to record an audition tape and be confirmed by about seven producers! Once in Vancouver we had extensive wire rehearsals. With pre-viz, the focus is action design and telling a great story through action. When preparing the actors, the goal is to give them good basics so that they can better handle choreography, or teach them the actual choreography they will shoot. With playing the role, you have to do what every actor does, give the character dimension and detail and make the dialogue natural and of course bring all the additional stunt skills. BK: Do you prefer acting or stunts or would you like to continue to do both? DN: I think acting involves physicality, so stunt work is purely an extension of the same craft. Even if you have no dialogue, you cannot be a good stunt performer unless you understand that. As a stunt double, you need to “mimic” the actor. These are all skills you learn as an actor. I feel the traditional idea was that actors are looking for the spotlight, while stunt people are meant to be the invisible people working to make the actors look good. For this reason, some stunt people don’t work on their acting skills. There will always be a need for stunt actors (i.e. people who need to act and be physical). That has definitely been my niche for my entire career, however I don’t let it stop me from doing pure stunt work (without the acting component) or pure acting (without the stunt component), or filmmaking (without either acting or stunt work). I enjoy it all, and I’ll keep doing it all! DN: As a filmmaker, I tend to absorb from everything I watch, but the first person that comes to mind would be Jackie Chan. There are so many little “tricks of the trade” that he taught me, however the biggest take away with him was his attitude. For the biggest star in the world, he never acted like it. If we had to move boxes, he would join in and move boxes. One time we were in Thailand for a commercial shoot and as we walked back to our first positions, he plucked some rubbish off the street. When we got to the other end, he dropped it into the bin. Other filmmakers that shaped my movie appreciation in the early days would include: Tarantino, Luc Besson, James Cameron, Park Chan-Wook, Kim Ji-Woon, Bong Jun-Ho, Robert Zemeckis, Spielberg, Scorsese, Tsui Hark, John Woo, Ridley Scott, Wachowskis, I dunno, I could go on and on. DN: The Debt Collector will be coming out soon. I have a fight with Scott Adkins in the opening scene. I also have an opening fight with Max Zhang in the upcoming Escape Plan 3: Devil’s Station. I like staying creative, so I’m thinking I’d like to direct something this year, but for now I am recovering from shoulder surgery so that has become my short term priority. BK: What do you think Ace is up to right now? A very special thanks to David No for agreeing to participate in this interview and to david j. moore for helping set it up. Check out David William No’s Facebook page here, Instagram page here, and YouTube page here. Blindsided: The Game poster from Blindsided: The Game Facebook page. All other images from the David William No Facebook page.